Highly variable, but tends to be medium golden or reddish brown. 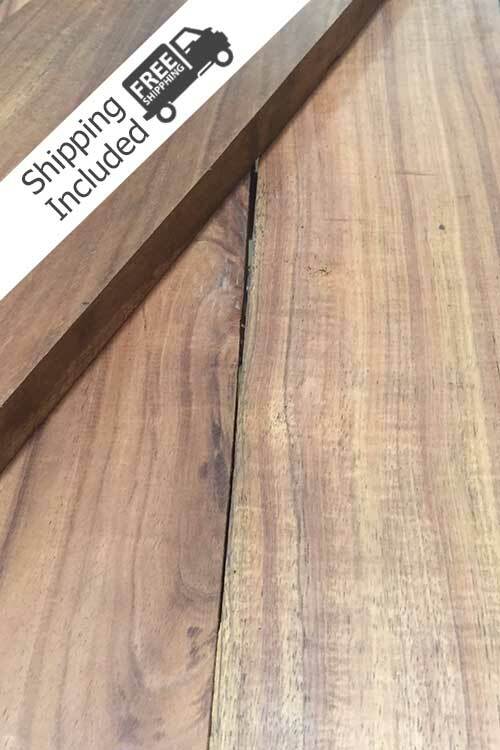 Koa Lumber Pack | 10bf | 25bf – You can specify widths & lengths in the order notes. Please use our board foot calculator to see what sizes fits within your request. Koa lumber’s color can be highly variable, but tends to be medium golden or reddish brown, similar to Mahogany. There are usually contrasting bands of color in the growth rings, and it is not uncommon to see boards with ribbon-like streaks of color.. The principal uses are veneer, furniture, cabinetry, musical instruments (especially guitars and ukuleles), canoes, gunstocks, carvings, bowls, and other turned/specialty wood objects. Available in up to 10 foot with widths from 4 inches to 8 inches. Lengths are anywhere from 6 feet to 10 feet although for shipping UPS requires all boards to be 8′ or less. In most circumstances, is easy to work, and sands well. However, figured wood, or pieces with heavily interlocked grain can be difficult to plane or machine without tearing or chipping of the grain; also, Koa can occasionally give problems in gluing, though this is somewhat uncommon. Koa turns, stains, and finishes well.